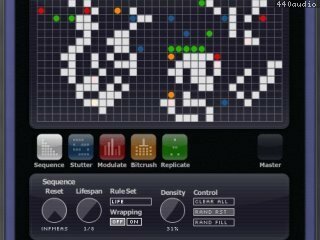 Automaton is a unique look at buffer effects, allowing you to experiment with artificial life within your DAW. With four separate effects (Stutter, Modulate, Bitcrush, and Replicate) driven by a cellular automata sequencer, Automaton is capable of adding subtle seemingly random fills and "humanizing" effects, but, if you like, you can crank the sequencer up to eleven and watch as your DAW becomes a petri dish while Automaton makes complete hay of the track you've inserted it to. 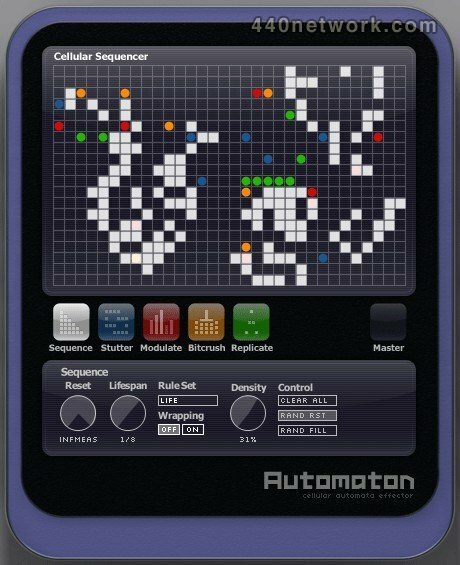 - Cellular automata sequencer with host tempo-sync, five different musically useful rulesets (including a step sequencer), extensive randomization features, and a life of its own. - Four sequencer-driven effects, including Stutter (a buffer delay for extremely short loop slices), Modulate (a self-modulating ring modulator), Bitcrush (sample rate and bit depth reduction, and our own "Error" effect), and Replicate (a special version of our Replicant effect, tuned for use with the cellular automata sequencer). - Master section allows extensive mixing capabilities, enabling Automaton to excel at either adding subtlety (like an occasional extra hi-hat) or complete self-generating IDM madness. - MIDI Learn for hardware control of most parameters (VST only). 5. .aupreset payload added to OS X installer. Automaton has been updated to v1.1.0 on all platforms. 1. Many minor bug fixes. 2. All versions are now 32- and 64-bit compatible. v.1.1.0 is a free download for all owners of Automaton, and is a recommended upgrade.